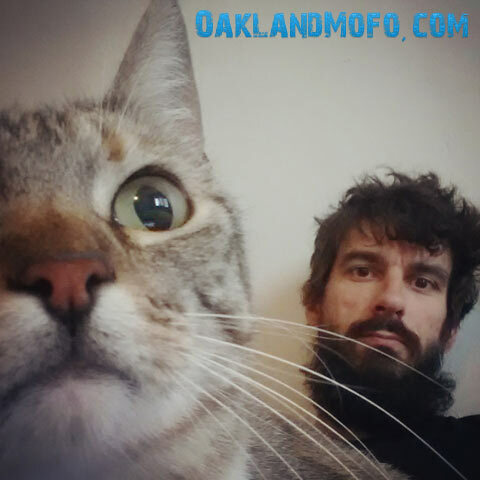 Where is the best place to adopt a cat in Oakland? Well you would think the answer is easy, but these days there are several options and you want to make sure you choose the right place. I mean, any place will do but it would be nice to put your money / time or effort into the best possible animal services. Also if you’re looking to volunteer for an animal shelter, this could help you decide as well. I myself got my kitty from Cat Town Oakland who now runs the Cat Cafe on Broadway. The EBSPCA is actually _NOT_ associated with the ASPCA that you’re so familiar with. They are only using the name for recognition but make it clear on the website that they are not in any way affiliated with the national organization known so well to fight for animals. However this organization claims to be founded in 1874 here in the East Bay as a solo venture separate and completely unrelated to the SPCA or City of Oakland. They have two locations, one in East Oakland and one in Dublin with a full Veterinary Clinic in the Oakland location that offers spaying and neutering. Both locations offer a pet adoption center and affordable(their words) spaying and neutering clinic with micro chipping services. 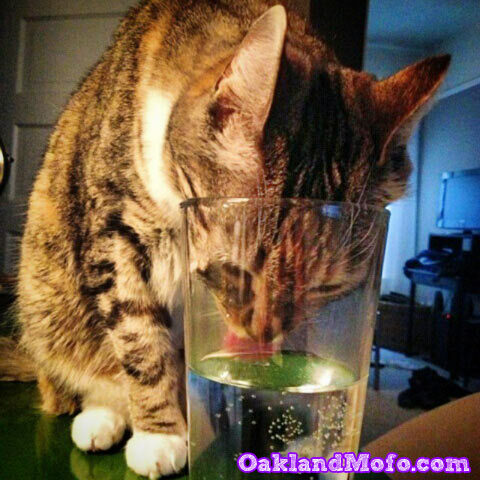 Oakland Animal Services is actually a division of the City of Oakland’s Police Department. This is a necessary division because as you can imagine OPD gets a lot of calls about animal abuse, dog fights, neglectful owners, dead owners, that kind of stuff, etc. How that works and is budgeted is beyond me however what I like about these guys is they are transparent. They are very active on social media such as Instagram, Facebook and Twitter, all can be found on their website. They have a nice clean facility near Lucky’s located in East Oakland bordering Jingle Town and Fruitvale. I myself have taken several friends here personally to adopt cats in the past and think this is the best way to go. If you want to volunteer for an Animal Shelter, these are the guys to help. Your local City government attempting to make Oakland a better place. Cat Town actually works with the suggested official Oakland Animal Shelter mentioned above. Many cats are put into shelters and are completely traumatized and don’t act themselves making them little hissing balls of fear that no one would ever think of adopting. Cat Town provides a less stress environment and has volunteers that foster the cats(like I did) so that they may become them lovable furry selves again. Furry little cuddly creatures that someone would want to rescue and take home. I actually had my kitty a few months before signing the paperwork and making the adoption official. While fostering you do have the choice of returning the cat and many people foster cats just to help out so that others can adopt. In fact I don’t think I’ll ever own another cat without first fostering because it gives you a chance to create a bond with the cat or figure out if the cat is just not for you. I signed the cat adoption papers during a Maddie’s Fund event which means Cat Town Oakland got extra funding and I didn’t have to pay anything. Everyone wins. Especially my kitty because she didn’t get put to sleep. Her name was “Sheeba” but that wasn’t no kitty name for me so she has been renamed to Artemis Bug aka Artemis Thug. She tries to fight other cats through the window and I can’t let her outside because she is FIV Positive. This was some time ago, times have changed. 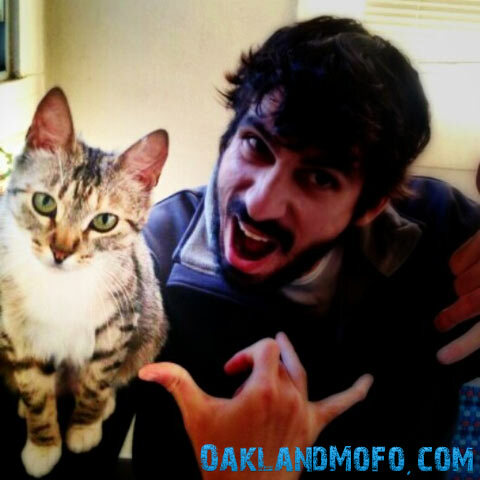 Cat Town now owns and operates Oakland’s first Cat Cafe on Broadway and 26th. There were some issues getting off the ground such as being able to have cats and food in the same building. However they were able to get around that by offering 2 bathroom facilities, one for each side of the cafe and a hallway with doors on both sides separating cat adoption center from coffee shop cafe. 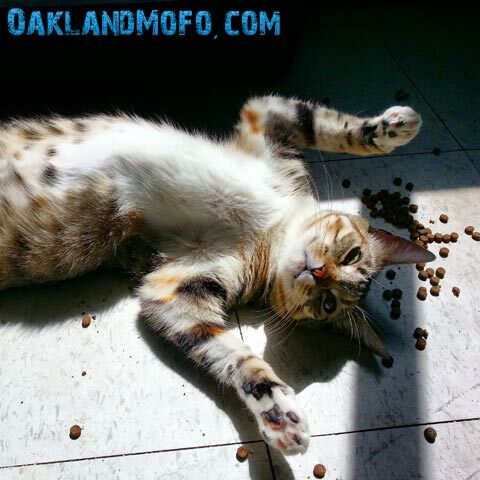 The reason they brought the cat cafe to Oakland is you can now come out, get some coffee, food and visit with kitties in need of a home. Whether it be a permanent home or a foster home they are now easily visitable and this is something you can do casually in your spare time. 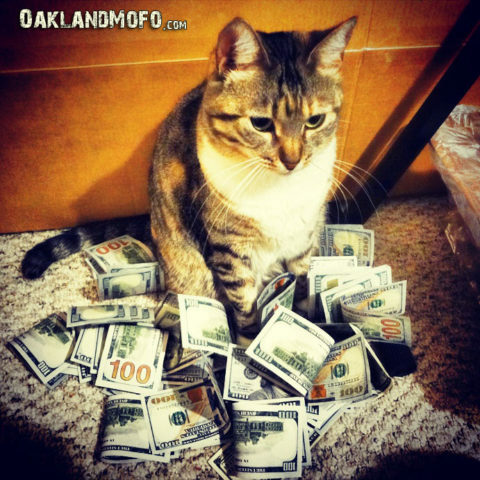 I guess you can say, helping two cats with one buck. If you care, here is my story on how I came about Cat Town in their early days before the cafe. A friend that I took to the Oakland Animal Services shelter about 7 years ago so that her sister can adopt a cat tagged me randomly in a post saying Sheeba(Artemis) needed a home. My first thought was wtf, I am not in the market for a cat. But I texted my girlfriend at the time asking if she was down and so it happened. Just pretty random how it all came around so many years later after I took her to Oakland Animal Services. What a little thug she is. She was actually featured on the Hood Cats 2014 Calendar. 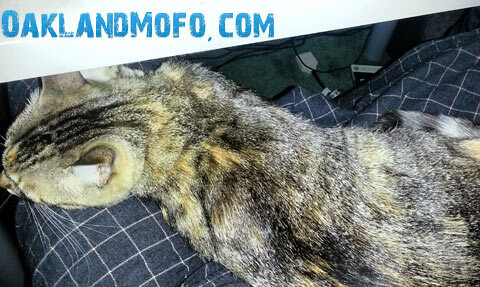 She is a great lap warmer kitty in the winter. The only bad thing about it is she makes it hard to get up when the time is needed. Like now, she’s on my lap and I want to go for a midnight snack. 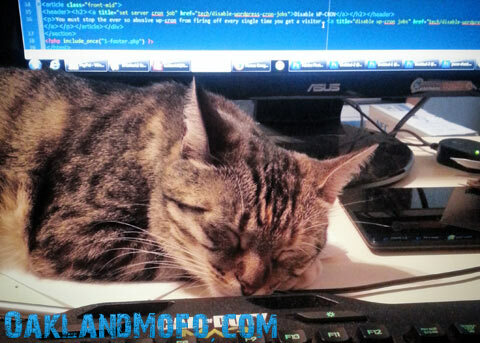 She loves to sit and sleep while I work on my websites. Isn’t she the cutest thing ever? You can foster or adopt your own at the Cat Town Cafe! Ha! 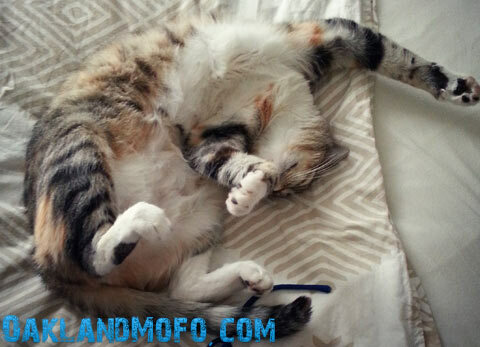 Just when you thought this cat couldn’t get any cuter. She actually sleeps like this sometimes. If you can’t have a cat permanently, just foster one from Cat Town Cafe and help it become adoptable by others. 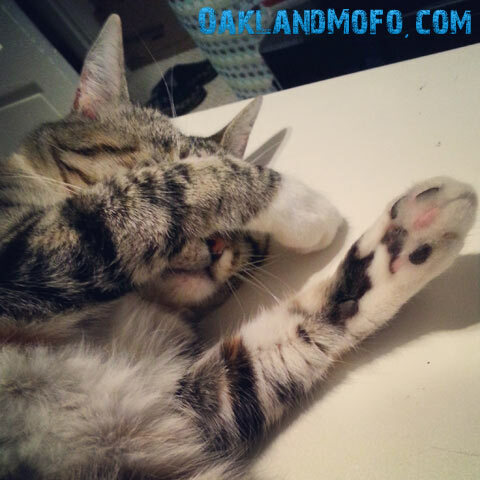 Can you believe the Oakland Animal Services has to put some cats to sleep because no one adopts them? Yes she did it again, got even cuter. I bet you were expecting an even cuter photo but nope, I had to put my mug up in this one. 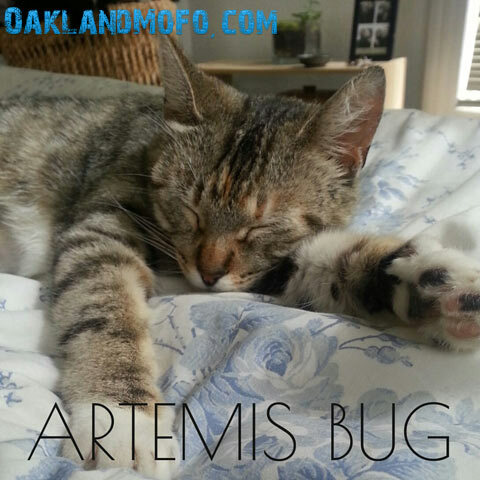 And THE CUTEST video of little Artemis Thug. Bottom line, cute adorable kittens and adult cats with character needs your help today and you can visit them at the Cat Town Cafe or adopt straight from the Oakland Animal Services Shelter on 29th. Please help save a kitty. Share this article.